A rapid RJ12 connection makes wiring easy and reliable and prevents wiring errors to simplify implementation and to save time. The DIRIS B-30 is a DIN-rail mounted power monitoring device for electrical installations integrating the most advanced power quality analysis funtions. The device has 2 digital input for additional versatility and includes Modbus RTU serial communication to report all information to external management systems. Additional communication, input/output modules can extend the basic functional scope of the DIRIS B-30. An optional display can also be plugged to the meter. 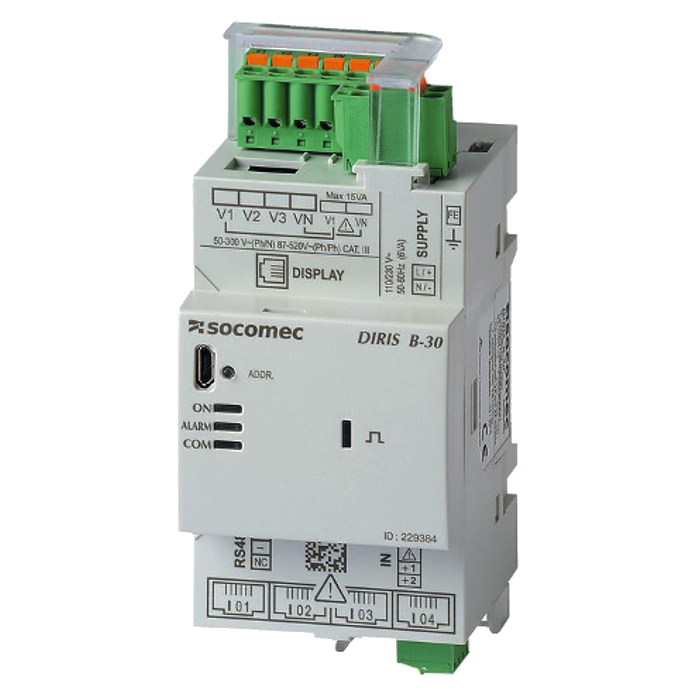 The device has 4 independent current inputs to monitor 1 three-phase circuit or 4 single-phase circuits. The DIRIS B-30 is compatible with TE/TR/iTR/TF smart current sensors, suitable for new or existing installations.